Adrian O’Neill, captain of 60 metre Y.CO charter yacht Oasis, reveals some lesser-known highlights of the classic Porto Cervo to Capri run... 1. Il San Pietro di Positano Hotel The San Pietro hotel is south of Positano on a cliff top and is one of the best hotels to visit by superyacht. You anchor outside — it’s shallow water, 13 metres — walk from the jetty into a cave, where a tiny lift, built into the rock, takes you all the way up to the hotel. When you step out you are in a different world, with magnificent views over Positano and Capri in the distance. Sitting out on the terrace for drinks, with the Italian tiles and marble, is a genteel experience. 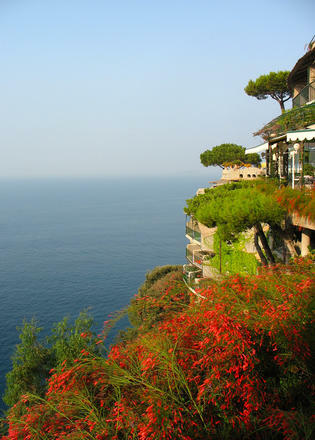 The San Pietro hotel is south of Positano on a cliff top and is one of the best hotels to visit by superyacht. You anchor outside — it’s shallow water, 13 metres — walk from the jetty into a cave, where a tiny lift, built into the rock, takes you all the way up to the hotel. 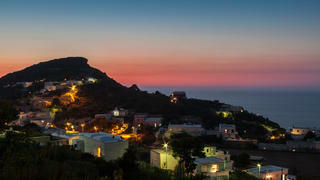 When you step out you are in a different world, with magnificent views over Positano and Capri in the distance. Sitting out on the terrace for drinks, with the Italian tiles and marble, is a genteel experience. A fabulous restaurant. It’s on Ischia, about 300 metres south west from Castello Aragonese, the little fortress, and partially hidden by the rocks of Scogli Sant’Anna, which is where the restaurant can be found on a chart. No one speaks English and the menu needs some Italian but its one of the best rustic restaurants in the Mediterranean. The food and view are extraordinary. This is a tiny island next to Ponza. A lot of yachts sail past without realising what superb swimming it offers. Only when you get close can you see the tiny coves and crystal clear water, with looming limestone cliffs. On the south west side is a cave we take guests through – a high ceiling and narrow sides – and out the other side. The ocean swell enters through the exit we use, so this trip should only be attempted when conditions are favourable, otherwise a reverse route is recommended. Nerano is on the south east side of the promontory that leads to Positano. A line of shoreside restaurants includes Lo Scoglio and Taverna del Capitano, but just to the east is a small bay by an islet called Lo Scogli. Here is my favourite restaurant for fresh, simple Italian fare: La Conca del Sogno. Anchorage is outside the buoys, close to the island. 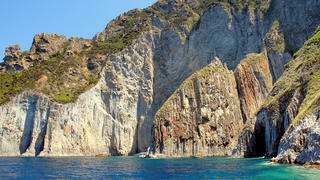 If we spend the day at Palmarola, Ponza is the choice to spend the evening. 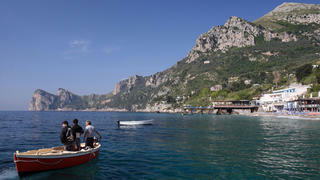 Only eight nautical miles from Palmarola, it breaks the distance before the next leg to Ischia or Capri further south. The town, with little shops and boutiques, is very pleasant, a genuine Italian fishing village. It’s great for a walk before dinner, coffee or aperitif – it’s not high end, but has a typical Italian flavour. The best tender dock is at the end of the line of ferries and Guardia di Finanza craft and can take tenders up to eight metres.